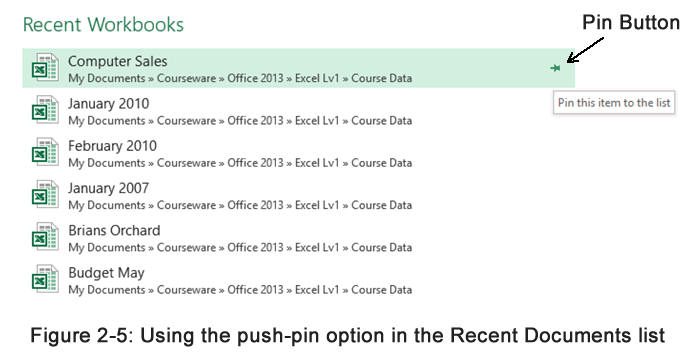 These topics are covered in Module 1 - Excel Level 1 Introduction course. When you first start Excel, a blank default workbook is loaded. You can use this blank workbook to start a new worksheet. But what if you have already used (saved and closed) the default workbook? At this point you have a couple of options. One would be to open a workbook stored on disk; another would be to create another new, blank workbook. For classroom-based Excel training in Chicago and Los Angeles call us on 888.815.0604. 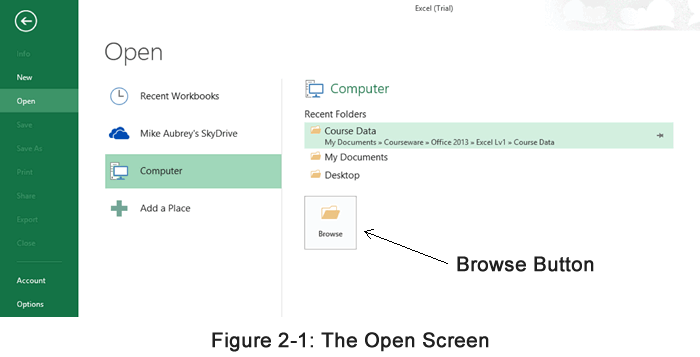 You open an existing workbook using the Open screen, illustrated in Figure 2-1. 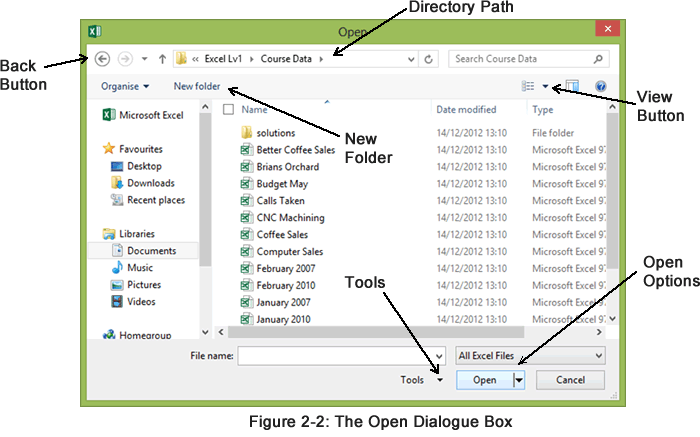 By clicking the browse button shown in Figure 2-1 to make the Open Dialogue box appears Figure 2-2. Besides specifying a file to open, you can also tell Excel to search for a particular file based on a set of criteria, such as a word or property it contains. The Open dialog box also contains several tools that allow you to change the view in the Open dialog box. Most of these tools, similar to those used in My Computer navigation, will be familiar to you already. Click the FILE button and choose Open. In the Open screen, if the file you wish to open is not listed, click “Browse” to select the desired drive or directory. In the file list box, select the desired file. Note: You can also double-click the file to select and open it. In the following exercise, you will open an existing workbook and then close it. Load Excel. [Excel loads, and Book1 appears]. Click the FILE button and choose OPEN. [The Open Screen appears]. Click Browse and in drop-down list box, select the required drive or directory. In the file list box, under NAME, double-click the Data folder. In the file list box, select Budget May. Choose Open. [Budget May opens]. Close the open Budget May workbook. Do not save any changes. [The worksheet window is blank]. 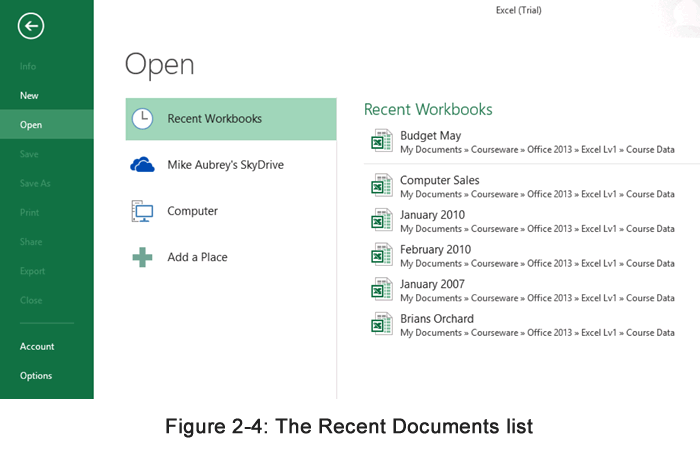 When you create a new workbook, you have the option of choosing one of Excel’s built-in workbook templates. 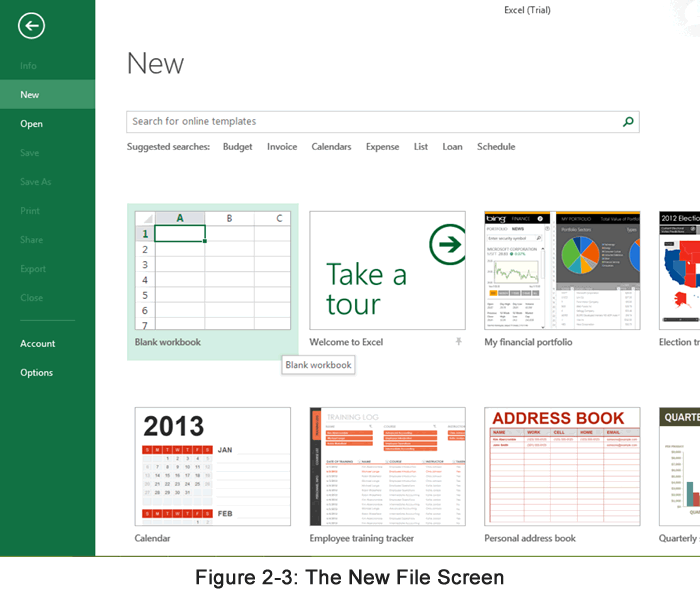 Depending on how Excel was installed, these could include templates for purchase orders, expense reports, invoices, and more. The template you’ll use the most, however, will probably be the blank workbook. Although you can access the blank workbook template via the NEW command from the FILE BUTTON menu, there is an easier way. Click the FILE button and choose New. In the following exercise, you will create a new workbook and then close it. Click the FILE button, click New and choose Blank Workbook. [Book2 appears on the screen]. In cell A2, enter 2nd Quarter Summary. Save the file with the name 2QTR Summary. Close the new workbook. The worksheet window is blank. Excel stores the names and locations of the last 17 files you used (by default). This number can be increased or decreased using advanced settings options. You can open any of these files simply by choosing the appropriate pathname in the list of Recent Workbooks listed in the display generated when you click the FILE button and Open select RECENT. An example is shown in Figure 2-4. Using this feature saves time because you don’t need to access the Open dialog box. From the File menu, choose the file you want to open. In the following exercise, you will open and close a recently used workbook. From the File menu, select Budget May. [The selected file opens]. Note: The more recently opened files will push out the ones less recently opened and these will disappear off the bottom of the list. You can override this by clicking the push-pin symbol next to a file you wish to keep in the list. In Figure 2-5 the file Better Coffee Sales has been permanently saved in the list. Click the symbol again to release the file from permanent residence on the list. Do you need to join a 1-day Excel workshop? We run beginner, intermediate and advanced classes every month. Check our past students Excel class reviews.